We are so grateful for the people who courageously serve their countries on a regular basis, for they deserve love too! Today’s feature is another great love story of a beautiful bride and her Air Force groom, captured by Anna Kim Photography. Just like one of our previous wedding features, this Maui wedding takes place in one of the most beautiful parts of Hawaii. This couple’s love story started with a simple Halloween party in Japan that changed both of their lives. The bride looks elegant in a tulle-lace mermaid gown complete with a flowing veil. The colors chosen for this Maui wedding are kept sweet and charming with light pinks and lilacs that beautifully accent the bouquets and reception tables. 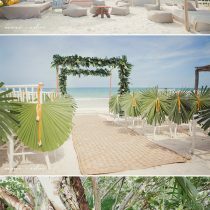 For a small destination wedding, the venue by the beach worked perfectly so that they got the best of both worlds. 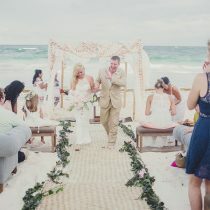 After a long but very rewarding day, the couple was able to relax in a hammock to bask in their new lives as husband and wife. Love your photo documentary of their wedding. Thanks for sharing! Actually beach is so cool. Windy, sunny and most of all very romantic.